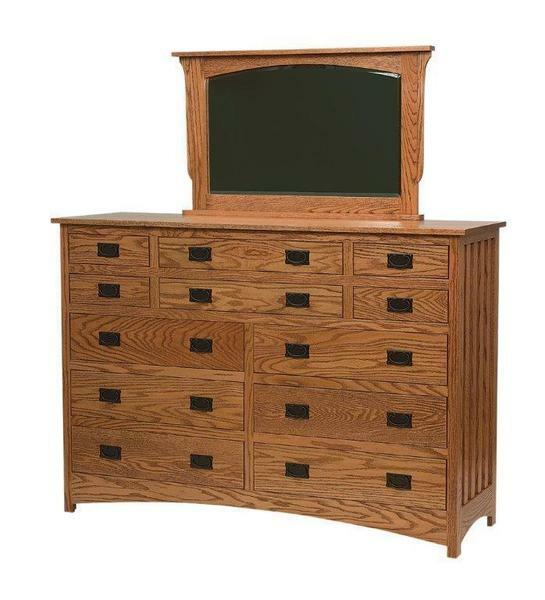 The Amish Schwartz Mission Dresser with Twelve Drawers is a dream come true in any bedroom! This solid wood dresser offers twelve drawers in a variety of sizes to organize clothing, delicates, accessories and more! Mission style furniture combines design and function with exquisite construction to create an elegance that never loses its appeal. This heirloom quality dresser will serve you and future generations in style. There are six spacious drawers for larger items, two long and slender drawers and four compact drawers for smaller items. Customize this Amish dresser to include felt lined sliding jewelry trays and cedar bottom drawers. The Schwartz mission dresser is shown here in oak wood which exudes warmth and welcome. Consider the Amish Schwartz Mission Dresser with Seven Drawers if you are looking for a smaller model. Call one of our Amish Furniture Specialists today at 866-272-6773 with any questions or visit our DutchCrafters Furniture Store in Sarasota, Florida to experience Amish furniture in person.